I am two months into my first work-camp experience and thought it time for a report. Kaye and I have been camping at Kenney Grove Park, a historical site established in 1888 and coinciding with the founding of the town of Fillmore, California. 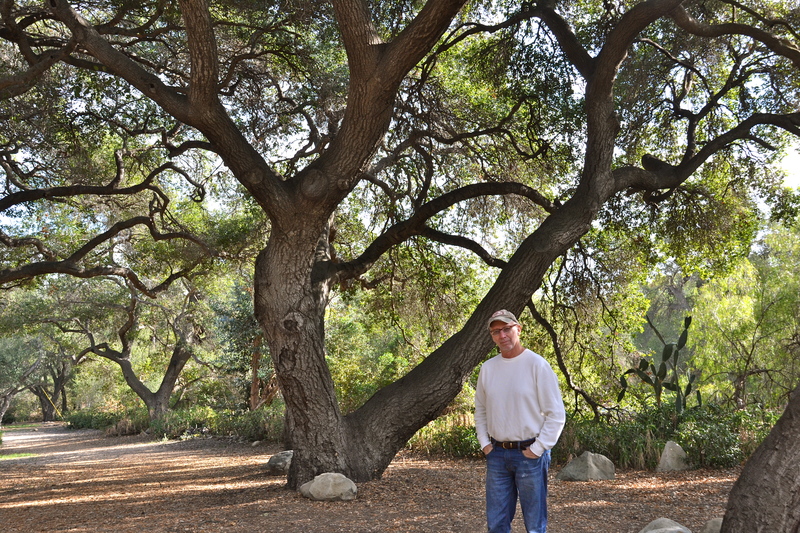 The park is owned by the County of Ventura, but is under private lease. 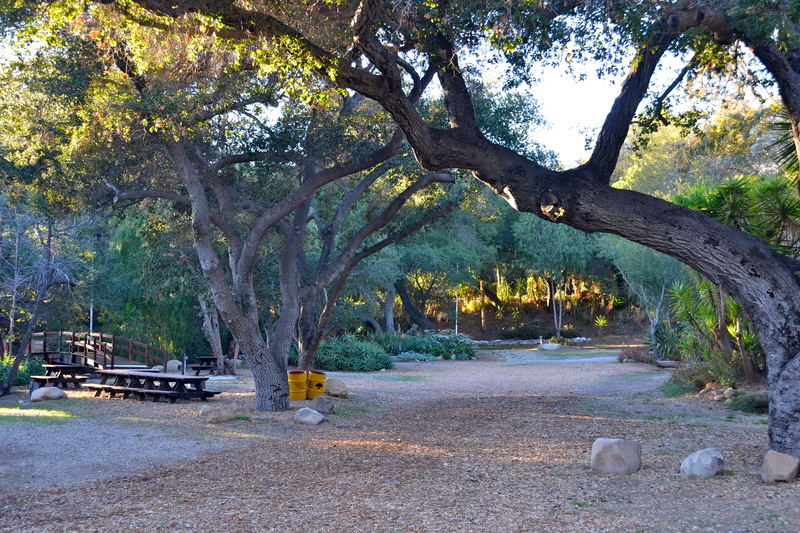 It is used mostly for events by groups who lease the campground. Kenney Grove Park is sheltered by a canopy of massive old oak trees. The work-camp arrangement is growing in popularity and there is an abundance of listings online at sites like Workers on Wheels, The Sowers, and Work-Kamping and others. The assortment of possible jobs ranges from camp hosting to maintenance to trail guiding and a lot more. Most workers put in 20 or so hours per week in exchange for a campsite with hookups for their recreational vehicle. Our campsite at Kenney Grove Park. 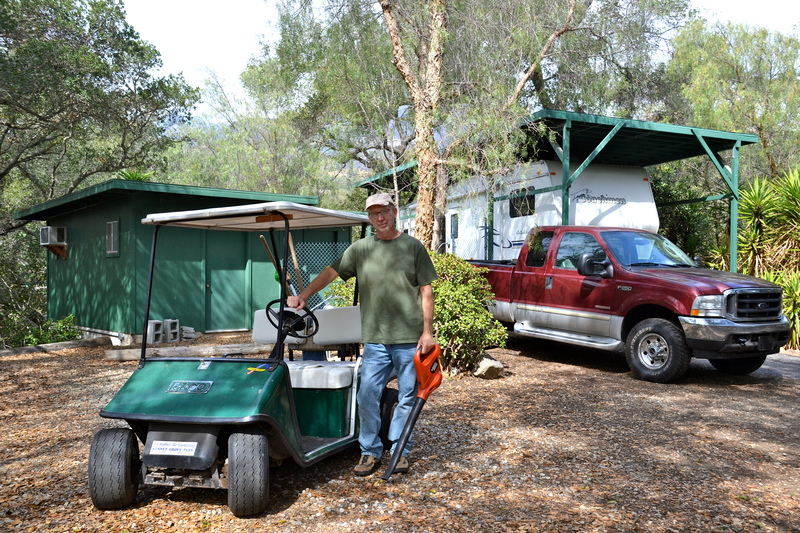 Our site includes a canopy over the RV and a storage shed and small patio surrounded by oak woods. It sits on a small hill in the middle of the park at the foothills of the mountains and at the edge of Los Padres National Forest. We are 30 miles from the Pacific beach. My responsibilities include a wide range of tasks such as painting, repairing old equipment, felling trees and chipping them for mulch, washing picnic tables, and so on. Kenney Grove Park is a beautiful and quiet place to work and the winter weather is mild. I am not sure if I will pursue the same sort of plan for next winter, but it is really working well for me now. The work pace is relaxed, the tasks are not back-breaking, and the manager is pleasant and flexible. And it helps that the location is in a quiet valley in southern California where the winter temperatures are mild and the sunshine abundant. Well, honestly, the location is what attracted me to this spot in the first place. Back home in Michigan, I would have been dealing with the harshest snowiest winter in recent history. 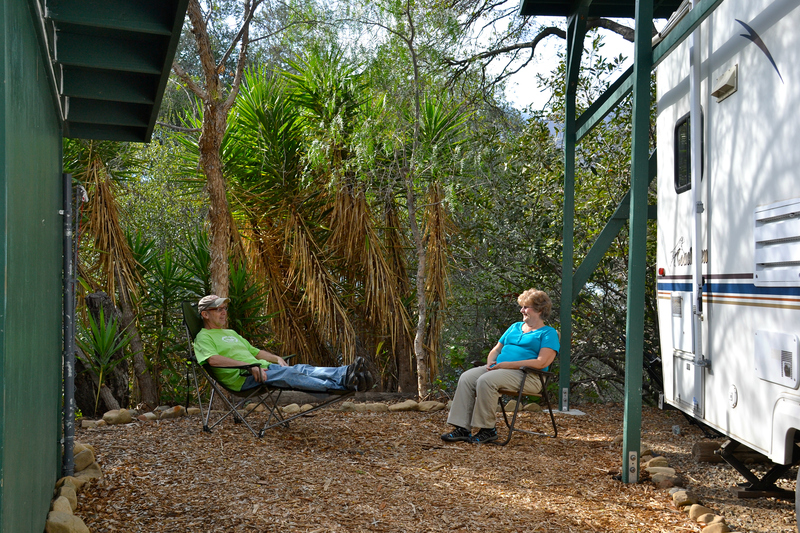 After work, Kaye and I enjoy relaxing on our own private patio next to the camper. Yep, this is working very well. I have three more months to go here before we hitch up again to pursue our epic trip to Alaska for the summer. Stay tuned! Looks awesome! Was there anything you didn’t enjoy about the gig? Hi, Christy. Kaye and I were frustrated with the lack of internet coverage in Alaska and all the way across Canada; we rely on it for our blogging and for a feeling of connectedness with our kids and grandkids. Of course, we didn’t really like the highway construction and the high cost of everything from fuel to food, but we were prepared for those conditions. The overall experience was hugely positive for us, a once-in-a-lifetime adventure that we will always remember vividly.